Not to be confused with the John Woo film Bullet in the Head. Bullet to the Head is a 2012 American action thriller film directed by Walter Hill. The screenplay by Alessandro Camon was based on the French graphic novel Du Plomb Dans La Tête written by Matz and illustrated by Colin Wilson. The film stars Sylvester Stallone, Sung Kang, Sarah Shahi, Adewale Akinnuoye-Agbaje, Christian Slater, and Jason Momoa. Alexandra Milchan, Alfred Gough, Miles Millar, and Kevin King-Templeton produced the film. The movie follows a hitman and a cop who are forced to work together to bring down a corrupt businessman and mafia boss after they are targeted by the latter's associates. The film premiered at the International Rome Film Festival on November 14, 2012. The film received a wide United States release on February 1, 2013. In the city of New Orleans, hitman Jimmy Bobo and his partner Louis Blanchard kill a corrupt former MPDC policeman, Hank Greely, although Bobo leaves a prostitute, Lola, alive. Later, at a bar, Blanchard is murdered by another hitman, Keegan, who also attempts to kill Bobo but fails. Kwon meets with Lieutenant Lebreton to ask for his help, but Lebreton tries to kill him, as he is also on Morel's payroll. Bobo kills him and saves Kwon. Meanwhile, Keegan learns about Lisa and kidnaps her. Morel then calls Bobo and offers to trade Lisa for the flash drive. Bobo agrees, and meets with Morel in an abandoned warehouse, where he delivers the flash drive to him and Lisa is returned to him, while Kwon infiltrates the building to arrest Morel. Keegan becomes furious when Bobo is allowed to leave; he kills Morel and his men before confronting Bobo; they fight until Bobo stabs Keegan in the throat and Kwon shoots him dead from afar. The film is based on Alexis Nolent's French graphic novel Du Plomb Dans La Tête ("Lead in the Head"), with a screenplay by Alessandro Camon under the working title "Headshot". The producing team previously produced the film I Am Number Four. An executive attached to the film has said, "[This movie] is exactly the type of fast-paced, universally themed project that suits our business model. Sylvester Stallone is an international icon and we're really excited to be in business with him." When Sly and I first talked about doing it, I told him I thought if we did it as an homage to ’70s or ’80s action films – and if he got a haircut and if we played it not at some nuclear level and left a little room for humor – everything would probably work out. I mean, this is one of those plots... You know, in terms of the real world, they’re fairly preposterous. But that's OK. That's part of the given. As long as you don't break the rules and contradict yourself within that sensibility, people go for the ride.... Sly and I have known each other for probably 35 years. I have always been a great admirer of Sly's. Most directors love movie stars because they’re such fabulous tools to tell stories with. Sly is an actor but he's a star and he's been a star for a very long time. When he sent me this, there was a feeling on both our parts, that if this was ever going to happen – us working together – we better sit down and do it. Time is moving on. The real truth is these movies are all foreign driven. They need domestic releases. If the economics are right, people feel like they can be commercial in a reasonable way domestically. But they’re really foreign driven. This movie would not exist without expectation of the foreign audience being vastly greater than the domestic. We’re not breaking new ground. We’re trying to be entertaining within a format that's familiar. There's a kind of ice skating that goes on where you must let the audience know that you're not taking yourself too seriously. But at the same time, the jokes are funny but the bullets are real. The jeopardy has to be real. When it gets outlandish, there needs to be no drift into parody – self-parody, maybe inevitable for old directors. They don't like each other. They’re not going to like each other. The most they’re going to achieve by the end is a kind of grudging respect. I'm just comfortable with that. It seems to be an inherently more dramatic situation than if they’re friendly and they get along and respect each other. Also, frankly, it gives you better avenue to work in humor. These things have to be leavened with humor. It actually reinforces the action. One of the things I like about New Orleans is it feels like you're in a western with the architecture. All the balconies, the old buildings, it feels like you're in the 1880s. Some of it spills into the movie. I don't know how much of it creeps into the edges and helps you or how much of it is just by design. Usually you're trying to tell a narrative through your characters and have all this stuff bleed in around the edges. Hill said he told Stallone "to play things more casually. I wanted him to play his natural personality as much as possible. He's a very engaging guy. I told him, “I'm not interested in you inventing a character as much as imagining yourself as character.” He went right with that." On August 23, 2011, it was announced that the film would be released on April 13, 2012. On February 23, 2012, the release date was moved back. It was released on February 1, 2013. On Rotten Tomatoes the film has an approval rating of 47% based on 133 reviews. The site's consensus reads: "Bullet to the Head's unapologetically trashy thrills evoke memories of its star and director's proud cinematic pasts – but sadly, those memories are just about all it has to offer". On Metacritic the film has score of 48/100 based on reviews from 34 critics, indicating "mixed or average reviews". Audiences surveyed by CinemaScore gave the film a grade B- on scale of A to F. Jay Weissberg of Variety called it "a kickass actioner driven by personality rather than plot". Sylvester Stallone was nominated for a Razzie Award for Worst Actor for his performances in this film, Escape Plan and Grudge Match, where he lost to Jaden Smith for After Earth. 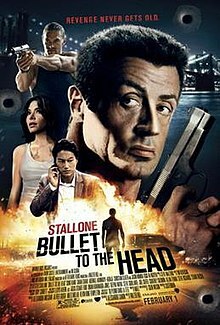 Bullet to the Head was Sylvester Stallone's worst opening weekend gross in 32 years, and his second-lowest opening weekend gross of all time. Bullet to the Head made $4,458,201 for its opening weekend. As of March 24, 2013, the film has grossed $9,489,829 in the United States and $12,457,380 worldwide for a total of $21,947,209, failing to bring back its $40 million budget. The soundtrack album was released digitally on January 29, 2013 and in stores on February 19. The album features the film's score, consisting of 15 tracks composed by Steve Mazzaro and produced by Hans Zimmer. ^ "BULLET TO THE HEAD (15)". British Board of Film Classification. 2012-11-30. Retrieved 2012-11-30. ^ FilmL.A. (May 2014). "2013 Feature Film Study" (PDF). FilmL.A. Feature Film Study. Retrieved June 29, 2017. ^ a b "Bullet to the Head (2013)". The Numbers. Retrieved June 19, 2014. ^ Eric J. Lyman (November 14, 2012). "Walter Hill's 'Bullet to the Head' Wednesday's Highlights at Rome Fest". The Hollywood Reporter. Retrieved 15 November 2012. ^ Weissberg, Jay (November 14, 2012). "Bullet to the Head". Variety. Variety Media, LLC. Penske Business Media, LLC. ISSN 0042-2738. OCLC 810134503. Retrieved April 1, 2018. ^ (2011-06-13). "Sung Kang Joins Stallone's Headshot". Empire. Retrieved 2011-06-16. ^ "Thomas Jane talks about being fired from HEADSHOT and THE LYCAN – News". GeekTyrant. 2011-06-28. Retrieved 2011-12-16. ^ "Bullet to the Head Reviews". Metacritic. Retrieved 2013-02-07. ^ Weissberg, Jay (November 14, 2012). "Review: 'Bullet to the Head'". Variety. Retrieved April 15, 2016. ^ Adam B. Vary, "'Bullet To The Head' Opens With Sylvester Stallone's Worst Weekend Box Office In 32 Years", Buzzfeed, February 3, 2013. ^ Scott Gwin, "Stallone Bites Bullet to the Head", CinemaBlend, Weekend Box Office. ^ Daily box office report for 3-14-2013. ^ "Bullet to the Head' Soundtrack Details". filmmusicreporter. Retrieved 2013-02-12. This page was last edited on 21 April 2019, at 02:49 (UTC).